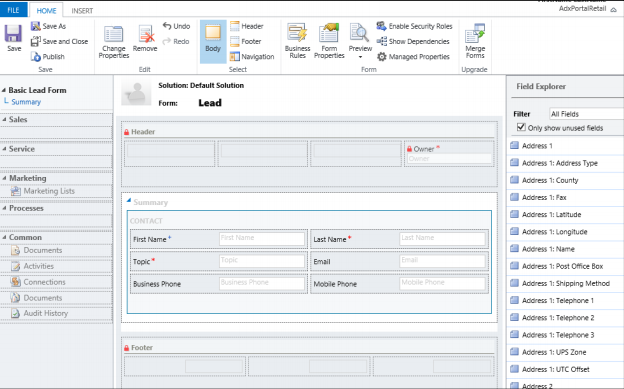 In this post we’ll look at how to create a new Lead form in Dynamics CRM and use it on the Adxstudio portal to capture the leads. First of all we need to create a new Lead entity form in Dynamics CRM. For this go to Lead entity, select Forms, click New, and select Main Form. Now in the form hide the Owner field and delete all other fields which are not required to be captured. Arrange the fields accordingly. Now click Save As and enter Basic Lead Form in the name. 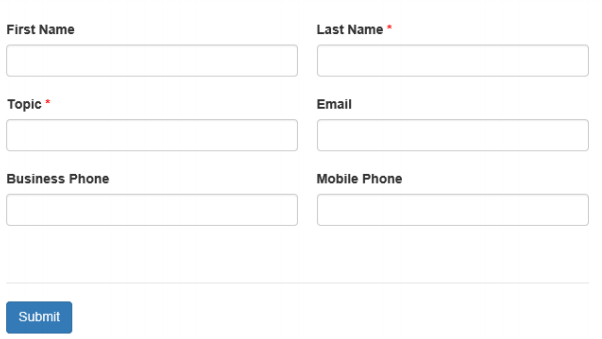 Publish the customization and close the form. Now navigate to Portals -> Web Forms in Dynamics CRM sitemap and click New. Enter Basic Feedback for Name, select Yes for Start New Session On Load, and click Save. From the Start Step lookup click new. Enter the details as shown in screenshot below. In the Form Definition tab, choose Basic Lead Form in form name and Summary in Tab Name. Tick the Associate Current Portal User checkbox as shown below and click Save. Now go to your Portal and log into it as an administrator. Navigate to Feedback or Contact Us page (depends on type of portal you have) . Click on edit and choose the newly created web form ( Basic Feedback ) in drop down and click Save. Refresh the page and your newly created form will appear in the portal. Now enter a lead record in the click Submit. Go to your Dynamics CRM organization, navigate to Sales -> Leads and you will find the new Lead that was created by the Portal.